The words of the Prayer of St Francis of Assisi, set to music in the chant-like melody created by the South African songwriter Sebastian Temple in 1967, are beautiful. The wisdom encapsulated in the hymn sings out to the simplicity of what lies at the root of human-ness. It matters not what faith one chooses to follow; it is universal that in seeing and reaching out to the souls of those around us we experience life to its fullest. There is little, if anything, more meaningful than feeling loved; understood; hopeful; consoled; pardoned when necessary and having the ability to walk and live in the light. When others embrace us in this way, we thrive. 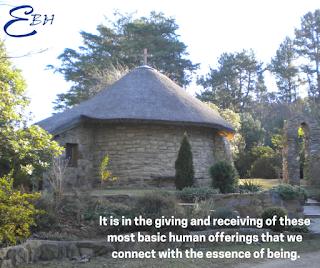 It is in the giving and receiving of these most basic human offerings that we connect with the essence of being, in both the best and the worst of times. Reflecting on the warmth and closeness shared during our chapel service at the beautiful St Patrick’s-on-the-Hill on the last day of March 2019, it struck me yet again, how the busy-ness of modern life so often blinds and deafens to the extent that we fail to engage and experience the full strength and impact of our personal power. While the world spins; titles and promotions are chased; technology develops and replaces the work of human hands; science discovers and we get caught up in the race towards ‘the next best thing’ in the pursuit of advancement, we become vulnerable to forgetting that in the end, the most honest memory and legacy we can leave, is that of who we were and how we connected with one another, as people. The community in which I have been living for the past year survives through drought, fire and flood, and thrives through festival, celebration and day-to-day living; ensuring that busy-ness, for its own sake, is pushed aside in the interests of connectivity. That is not to say that folk are not busy. They are, but it is their choice to balance activity with the channelling of a peace that emanates from the most pure recognition of what South Africans refer to as ‘Ubuntu,’ which draws people together. The resonance of the words of St Francis of Assisi, the power of giving and receiving and the strength of community – Ubuntu – could not have been more soulfully experienced than when one of our members shared her journey of the imminent adoption of her infant daughter during the above-mentioned service. There can be no further search for meaning and no greater sense of human-ness than in a moment when one becomes an integral part of the palpable love demonstrated by hugs, smiles and tears of joy, all while asking what is needed, how to help and what support can be provided. The giving and receiving was perfect in its completeness as we all became part of the story. There are opportunities all around us, every day, to share the spirit of peace and connectivity with one another, whether something said; an action carried out or merely the offering of a listening ear, a shoulder to lean on or a hand to hold. Opportunity is not always grand and loud, with the trimmings of recognition and favour; nor does measuring success by some man-made socially or intellectually created methodology always equate to being successful. Every one of us has the ability to become an instrument of adding value to the life of another, every day. No more is required than conscious awareness and the mindful use of the many moments in which it is possible to connect in this spirit of human-ness.